Leaves reduced to phyllodes. Flowers small, in bright clusters – see wattles below. Drooping shrub. Phyllodes ashy, 5-6cm long, 3-8cm wide. Pods flat, winged, 1cm wide, 2-5cm long. 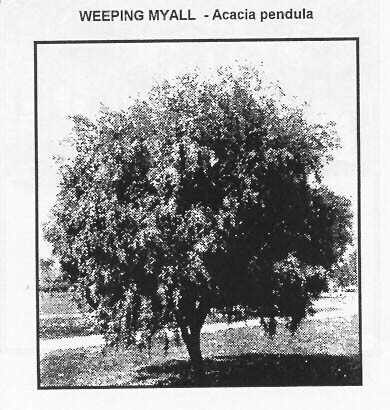 MYALL is a small tree with drooping branches and is often called WEEPING BOREE. MYALL is found on good well drained soil which may be alluvial, heavy clay or black soil plains. Tree-phyllodes silver, curved, 10-20cm long. Pods narrow, 5-13cm long. 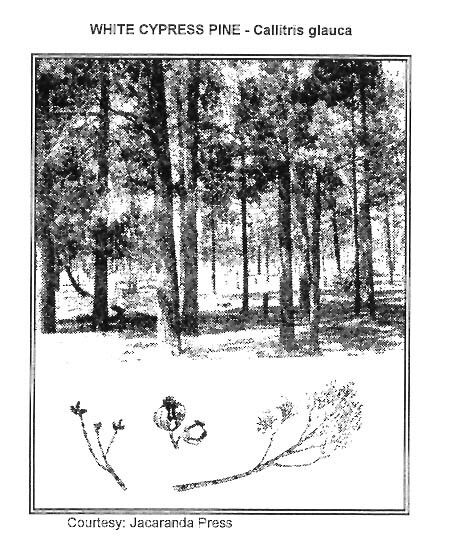 This wattle can grow to a medium sized tree and may be found in almost pure stands or as scattered individuals in mixed forests. It may also form dense thickets. It often grows on heavy clay soils, especially where these are subject to periodic flooding. Tree-phyllodes greyish, 2-5cm long, 2-9 mm wide. Pods thin slightly curved 2-5cm long. YARRAN is another of the wattles of the North West Slopes and Plains which can, given the suitable conditions, develop into a small to medium tree. It occurs as scattered individuals or in small clumps. YARRAN grows in a wide range of sites including river flats, dry ridges and red soil plains. The most extensive commercial forest type in NSW are the western forests containing an appreciable proportion of WHITE CYPRESS PINE and sometimes BLACK CYPRESS PINE. It is found throughout western NSW being best on fairly light textured soils between the 380 - 680mm pa rainfall. Vast areas have been destroyed for agricultural development but stands are still found in the Pilliga Scrub between Coonabarabran and Narrabri and other small forests are scattered throughout the western slopes and nearer western plains districts. Often associated with IRONBARKS, BOXES, and REDGUMS. It is a valuable timber. Forests are low and open and are often used for grazing. LEAVES REDUCED TO 3 OR 4 SCALES. WHITE CYPRESS PINE (callitris columellaris): Foliage greyish. Branches slightly drooping. Tree has rounded or straggly top). The white cypress is a slender pyramidal tree. This is not a true pine tree but was named as it looked similar to those which occur in Europe and North America. It is widely distributed in inland Queensland and NSW and forms the basis of most commercial forestry operations in the region. WHITE CYPRESS PINE produces timber of high quality and forests are carefully managed to ensure good supplies for domestic purposes. It prefers to grow on good sandy loam soils with a well drained subsoil. Much of the present wheat belt of NSW was previously covered by WHITE CYPRESS PINE. It is commonly used for shade and shelter particularly in the pastoral zones as it is resistant to drought and is not eaten by stock. It flourishes in areas of poor soil and low rainfall where most other species would perish. It is a good building timber and is termite resistant. Foliage greenish. Tree has pointed top. Bract has knob near end. BLACK CYPRESS PINE is less common than WHITE CYPRESS PINE and has a lower commercial value,. It is also has a slightly more western habitat. BLACK CYPRESS PINE prefers shallow, well drained sandy soil. It will grow on hills and stony ridges. 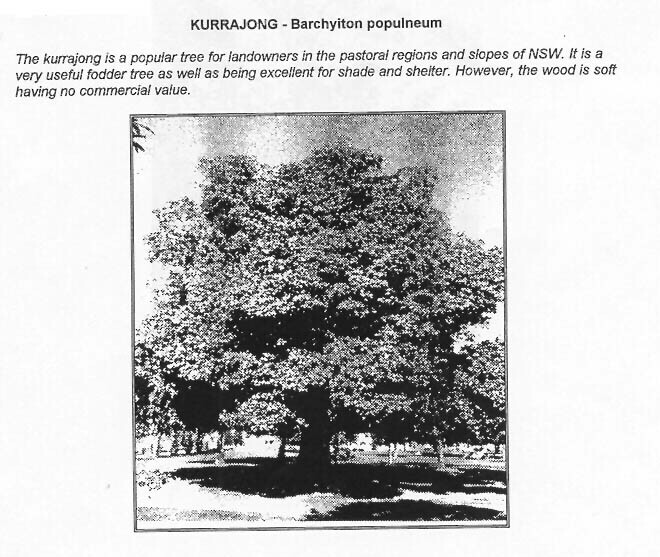 The KURRAJONG is a popular tree for landowners in the pastoral regions and slopes of NSW. It is a very useful fodder tree as well as being excellent for shade and shelter. However, the wood is soft having no commercial value. LEAVES REDUCED TO 9-16 SCALES. Cone about 2.5cm in diameter. Rounded as broad as long. BELAH is found throughout the Western Slopes and Plains usually on heavy soils especially those which are alkaline. It is generally confined to moist flats and depressions, floodways or seasonally inundated watercourses. It occasionally grows on red soils on higher ground where there are heavy clay subsoils.